New York based Microstock agency Shutterstock has just opened doors to their newest store: Music! Just like with Video, the new Music department is kept separate due to the difference in content and search but simple to use as the other products. As Wyatt Jenkins, Vice President Product at Shutterstock, the new music segment is a follow up on the successes of introducing Video to Shutterstock a few years ago: Moving images are a trend in electronic advertising, and many of them need the right music to transport a mood along with the pictures. The tracks are ranging from short pieces suited for a 30 seconds commercial up to a few minutes of track for an online video or presentation. The single pieces are categorized by Genre from Classics to Hip-Hop or by Mood or Tempo. Also, Shutterstock is offering a set of curated playlists containing a set of tracks aimed at certain usages such as corporate presentations or for trailers. Prices of the Music Offer – Save now! As with most of their offers, Shutterstock decided to keep the pricing simple: Only two price levels are offered for Standard or Enhanced Uses – the latter including unlimited usage while the standard license is limited to one million people in broadcast use and one country in theatrical use. The standard license comes at a regular price of $79 which is discounted to $49 for the start of the new collection. 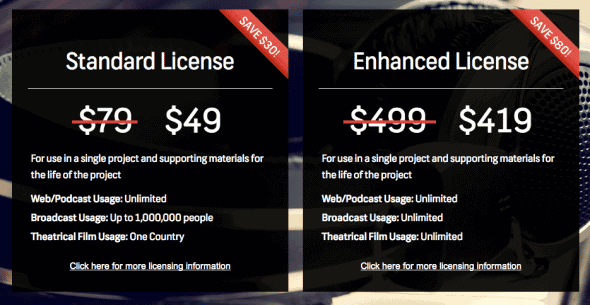 The Enhanced License costs $499 but can be purchased for $419 during the introductory period. Check out their pricing here now and do not miss the special offers. If you would need video footage for your music, check out our Shutterstock coupon code here!